There is no better example of sharing your talents with others than in the New Testament. 14 ¶ For the kingdom of heaven is as a man traveling into a far country, who called his own servants, and delivered unto them his goods. 23 His lord said unto him, Well done, good and faithful servant; thou hast been faithful over a few things, I will make thee ruler over many things enter thou into the joy of thy lord. 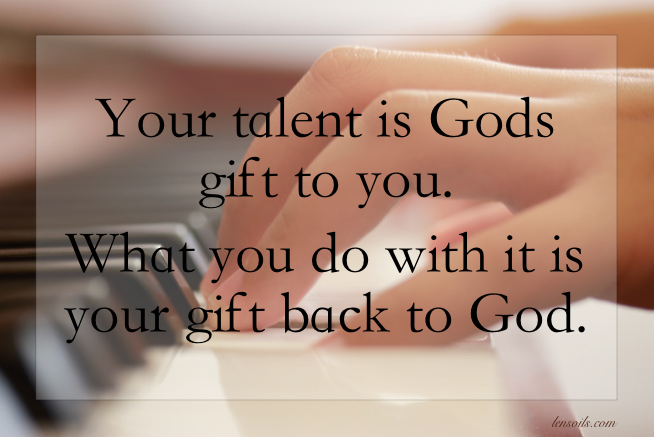 The more we share our talents the happier we will become. Are we sharing every talent we have or are we hiding them? I know people who literally can sing, dance or play a musical instrument that have hid their talents for years, no one knows how talented they are. Not all talents are obvious; some come in the form of empathy, humility, unconditional love and even good humor that can help lift our spirits. I am thankful for a thoughtful neighbor Dennis Peterson who can fix anything. He has helped our family with countless car problems and he is good at doing it. He can find a problem with any car in three minutes or less, this is no exaggeration. The world will be a better place to live when we wake up every day asking the question, who will benefit from my talents today. Go make a difference in the lives of others.